Let’s keep Queenslanders safe. Let’s stop alcohol-fuelled violence. Under the Liquor Act 1992 (PDF, 1.97MB) there are laws to minimise the risk of alcohol-related harm. 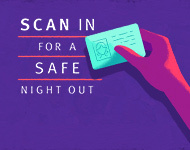 Networked ID scanning is in operation at all venues in safe night precincts (SNPs) that trade past midnight on a permanent basis (unless they are of a category considered low-risk or of an exempt class). This means that you will have your ID scanned each time you enter one of these venues. ID scanners have been introduced to help ensure the safety of patrons by checking each person's ID against a database of individuals who are subject to a banning order. If you are subjec to a banning order, the venue is legally obliged to refuse you entry. foreign drivers licences - must display name, photo and date of birth of the licence holder. (Where a foreign drivers licence is not in English, an international driver permit issued in the country of origin is acceptable). *If you have recently renewed your Queensland driver licence but are still awaiting its arrival by mail, you can present your expired driver licence for scanning. However, the licence must be presented with your Department of Transport and Main Roads (DTMR) Driver Licence Renewal Receipt. The latest time venues in SNPs can serve alcohol is 3am. However, licensed venues within SNPs will be able to serve alcohol until 5am up to 6 times per year to cater for special events. The time a venue stops serving alcohol is determined by their liquor licence conditions. Check the trading hours with the venue. You will have 30 minutes after last drinks are called to finish your drink. Venues can remain open to serve food, non-alcoholic drinks and provide entertainment after alcohol service ends. Inside SNPs you can access support services there to offer assistance to anyone needing help. The latest time venues outside of SNPs can serve alcohol is 2am. However, licensed venues outside of SNPs will be able to serve alcohol until 5am up to 12 times per year to cater for special events. Certain licensees may be able to continue to serve alcohol to residents and guests of residents, provided consumption is confined to the resident's room. Casinos and airports are exempt as they already have strict controls in place in their venues to address issues of harm. The nature of their operations also differs to other venues. Alcoholic drinks that rapidly intoxicate, such as shots, shooters and bombs, can only be served until midnight. pre-mixed alcoholic drinks containing more than 5% alcohol by volume and/or containing more than 2 standard drinks. A pre-mixed beverage must be within both of these limits to be served after midnight. Cocktails that are not designed for rapid consumption are exempt from the ban, provided they are listed on a cocktail menu with a set price. As of July 1 2017 ID scanners will operate in some licensed venues.